Why buy hummus when it’s better and cheaper to make it, especially when it’s just a matter of throwing a few things in the food processor. But first a couple of asides, since I’m an immediate gratification kind of cook I use canned garbanzo beans but if you’re the patient type feel free to use cooked ones. Also, tahini is a great condiment to have around so don’t be intimidated by the large can, it goes a long way and lasts a year or more. 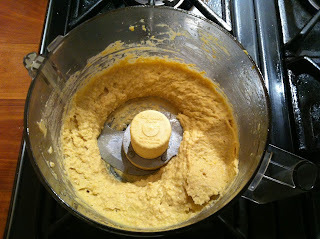 Okay, in a food processor add a can of garbanzo beans, a third of a cup of tahini, a quarter cup of extra virgin olive oil, one to three garlic cloves, a teaspoon of cumin, paprika, or cayenne, and the juice of one lemon. Hit the switch, if it’s too thick add more lemon juice or water. You can’t really go wrong, especially if you serve with a big splash of olive oil over the top.